A Springtime version of the classic Cornish Yarg which is wrapped in wild garlic leaves creating fresh, clean Spring flavours. 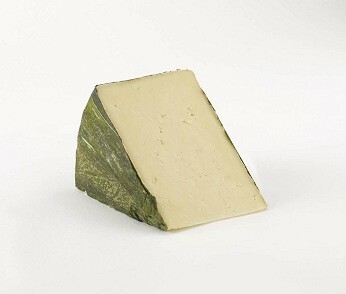 Wild Garlic Yarg is a Springtime variation of Cornish Yarg Cheese made by Lynher Dairies. The Garlic Yarg, like the Cornish Yarg, is semi-hard cheese and is deliciously creamy under the rind and slightly crumbly in the core. It has a young, fresh, slightly tangy taste as the cheese matures. The cheese making process is done by hand from the farm's milk and from 10 herds local to the dairy. Once the curds have been cut and the cheese is pressed into the moulds, the cheese is placed in brine for 24 hours. The cheese comes out of the brine and is left to dry for 48 hours and the Wild Garlic leaves are then placed in concentric circles on the cheese.The leaves are carefully brushed onto the cheese in a traditional pattern and they attract wonderful natural occurring moulds of various colours, which help the cheese ripen. The cheese is left to naturally mould ripen for the next three weeks. The wild Garlic leaves, which grow each spring, are picked locally to the farm by a team of 50 pickers. The leaves impart a gentle garlicky flavour and their moisture gives the cheese a slightly firm texture. The leaves add vibrant colour, giving the illusion of a cheese parcel wrapped with green silk ribbons. Cornish Yarg was first made by Alan and Jenny Gray in Withiel, near Liskeard, on the edge of Bodmin Moor. In fact, the word Yarg is simply the surname 'Gray' turned backwards. In 1984 they sold the recipe to Michael and Margaret Horrell who farmed near Bodmin. The business steadily grew and in 1995 the Horrell family met with the Mead family who were farming in West Cornwall and interested in farm diversification. Catherine Mead worked with Michael and Margaret to develop the business and in 2006 all production moved entirely to the Mead family farm. The Farm is now processing 2,000,000 litres of milk a year and making just over 200 tonnes of cheese.